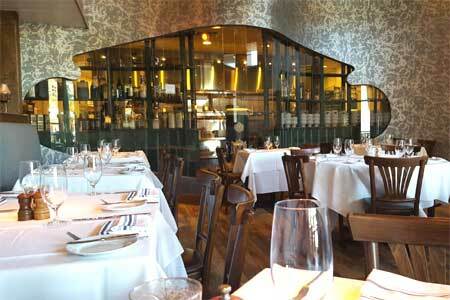 French cuisine and rustic stage-set décor at this popular refuge from Buckhead's bustle. : Fabrice Vergez and his life and business partner, Cindy Brown, are behind this bastion of French fare in Atlanta. The rustic stage-set décor contrasts substantially from that of the modern high-rise residential tower in which it's located. F & B is warmly lit and romantic, yet with moderate noise levels, it works for business purposes as well. Vergez’s many signature dishes include a white bean soup laced with truffle oil, making good use of a now-overused ingredient. Boeuf bourguignon, coq au vin, mussels, escargots, duck confit in salad and skate wing meunière, roasted and served with brown butter and capers, are on board. Foie gras has returned to the menu. Vergez claims to have introduced Atlantans to skate wing at now-closed Brasserie Le Coze, which he managed and later owned. While it's a great dish we've enjoyed often, we also like the Scottish salmon cooked rare as ordered with a side of ratatouille. Former sous chef Gabriel Capo now commands the kitchen, and has left the stalwart selections in good form while adding his own touches, such as a bouillabaisse. For dessert, try the classic crème brûlée or the rarely seen crêpe Suzette, proving that everything old can be new again. But while it's a bit dated, the molten lava chocolate cake merits attention as well. The wine list is a gathering of fine value choices from France and elsewhere, served at proper temperatures.